You are at:Home»Herbs»Dolichos biflorus Linn. Latin name : Dolichos biflorus Linn. Description : Seeds are antipyretic, astringent, deobstruent, diuretic, emmenagogue, laxative, lithotriptic, stomachic and tonic. Employed to reduce obesity and is also useful in kidney stone and oedema. Given to females during parturition to promote discharge of the lochia. Also used in leucorrhoea and menstrual derangements. Kulthi is known by different names all over the world, it is called, Kollu in South India, Cowpea in English, Kulti in Hindi, Habbul Kulth in Arabic, Kulatha Kalai in Sanskrit, Bian Dou in Chinese, Bonnavista Bean and also Hyacinth Bean. The health benefits of horse gram are being recognized light in the western world recently but has been known for its medicinal purposes by Indian Ayurvedic Vaidyas since centuries. It is known for its excellent diuretic and astringent. Ayurveda uses horse gram to treat a variety of conditions ranging from rheumatism to worm removal, treating Conjuctivitis and piles. Another great benefit of horse gram is its use in extracting phlegm. When suffering with cough, phlegm is a hard thing to get rid of. 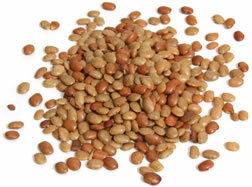 Taking horse gram water can eliminate the phlegm and give relief. Taking horse gram powder in a little bit of water regularly, helps in treating and controlling skin rashesand boils. Horse gram liquid is also used to regulate fever. Lipids extracted from horse gram have shown to help with peptic ulcer in an study related rats. Recommended Dosage : 3 to 5 g powder of dry seeds.